Kick up your heels in Forever Fever. The Skinny: A fun Saturday Night Fever-inspired tale of a downtrodden grocery store employee finding a new lease on life through the power of dance. Glen Goei's even-keeled drama is a hilarious and surprisingly compelling tribute to the film that made John Travolta a star. Disco may be dead, but its spirit lives on in Forever Fever, a crowd-pleasing dance flick from then-first-time director Glen Goei. The film contains a deft mix of comedy, romance, and drama, which results in a thoroughly charming homage to Saturday Night Fever, John Travolta, and even the late, great Bruce Lee. Although steeped in references to the 1977 disco classic, the movie avoids rip-off status thanks to ample doses of heart, humor, and originalitynot to mention an unmistakably Singaporean touch. Set during the late seventies, the film follows the life of Hock (Adrian Pang), a down-on-his-luck grocery store employee who longs for nothing more than a brand new Triumph motorcycle (a detail revealed in a rather amusing Easy Rider parody no less). 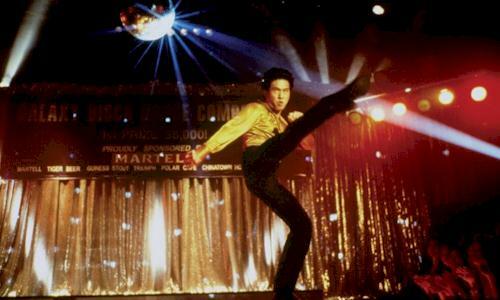 A rabid Bruce Lee fan, Hock decides to go to the theatre to catch a return showing of Fist of Fury. To his total horror, the film has been replaced with Forever Fever (a more copyright-friendly substitution for Saturday Night Fever). Although bored by the "hospital movie" at first, Hock soon finds himself entranced by the smooth dance moves of John Travolta's character. As fate would have it, a popular discothèque is holding a dance competition with a prize of five-thousand dollars, more than enough to pay for Hock's prized motorcycle. There's only one problem: Hock can't dance. Enlisting the help of his childhood friend Mei (Medaline Tan), Hock immediately signs up for dance lessons at the local dance studio. Although Bruce Lee had once served as Hock's primary spiritual advisor, soon John Travolta himself (well, actor Dominic Pace doing a half-assed Travolta impression) steps off the screen to give Hock advice about life, love, and that groovy disco style. Unfortunately, the totally oblivious Hock fails to recognize that Mei's feelings for him are no longer completely platonic. In a plot point pulled straight out of Saturday Night Fever, Hock drops Mei in favor of Julie (Anna Belle Francis), the sultry girl in his dance class who just happens to be dating the film's primary antagonist. But no worries, this is a disco-themed movie after all, and (almost) everything gets resolved after the big dance-off. As silly as its plot may sound in print, Forever Fever is an unexpectedly solid comedy with heavy dramatic leanings. Thanks to some fine performances from its cast, the film never deteriorates into just another rote imitation of Saturday Night Fever, even when it lifts scenes verbatim from its more famous predecessor. Adrian Pang brings a relaxed naturalism to the role of Hock, a quality that only increases the authenticity of his portrayal. He isn't a zany protagonist, but very much a "regular guy" with real feelings, who has his moments of wit and wackiness just as all regular people do. The remaining characters are just as engaging, with Hock's siblings being probably the most memorable. Pam Oei gets plenty of laughs as Hock's sister Mui, a girl who reads nothing but trashy romance novels which result in her asking Hock questions like "What does it mean his member stiffened?" In probably one of the more challenging supporting roles, Caleb Goh acquits himself well as Leslie, Hock's med student brother. It's easy to see how Leslie could have deteriorated into just another stock villain: the arrogant know-it-all son, beloved by his parents at the hero's expense. But writer/director Glen Goei imbues Forever Fever with more depth than its fluffy subject matter would lead one to believe, giving Leslie not only a more rounded character, but also a surprising secret that propels the last quarter of the film. Despite the more "showy" aspects of the role, Goh very much seems like someone's younger brother rather than a performer, a quality that only enhances the character's mid-film revelation and his problematic transformation by story's end. This twist is handled well, and in keeping with the more realistic tone of the film's dramatic parts, not everything is resolved by story's end. Notes:  The film contains numerous covers of popular disco songs.  According to the Miramax box art, the film-within-a-film Forever Fever is a low-budget Saturday Night Fever ripoff. However, evidence in the film strongly indicates that Forever Fever IS Saturday Night Fever but simply renamed, possibly to avoid copyright infringement and allow for the fact that the Tony Manero/guardian angel character would not be played by John Travolta.